Lightening hair is a staged procedure. To become charming and pretty blonde, not quite one of lightening hair dyes. It is best if this procedure you will do in the Barber shop from an experienced master. If your hair is bright colors and has not been previously dyed with chemical dyes to lighten them a few shades you can paint from the store in the home, observing the instructions for use. But if you are the owner of dark hair, also repeatedly painted, you will need a gradual lightening. Better to do this procedure at the hairdresser that will be able to assess the real condition of your hair and to warn about possible negative consequences of clarification. Before the procedure of lightening dark, previously colored hair, you can carry out the procedure of washes of color with a special drug. The essence of this procedure is that water releases from the structure of the hair pigment chemical dye without affecting the natural shade. If it is not possible to make a pre-wash, a week before bleaching to wash your hair with dandruff shampoo - he washes the paint from the hair structure. The second stage is the lighting. Dark hair is better to discolor a professional powder in combination with an oxidizing agent. Remember that the higher the percentage of the oxidizer, the faster it lightens the hair, but much stronger damage them at the same time. So barbers often use oxidizing agents with a small percentage, but carry out the procedure of lightening several times in a row. Lightener applied to the hair quickly, wrapping a small strand of hair with foil, to make a process more efficient. If after the first composition is rinsed from the hair, the result of clarification has not yet been reached should be applied on the hair the second portion. With the proper observance of all the subtleties of the process in the end of bleaching, you should get a light yellow color hair. The final stage of the bleaching - hair coloring or toning. Hair coloring definitely after bleaching because hair after this procedure, empty inside, scales them open. In this state, they will break and look awful. After painting gentle shampoo dye hair filled the inside, it looks more cared vanishes the yellow tinge, the scales of the hair are closed, becomes shiny. After the procedure of lightening the hair needs careful care. They need constant nutrition and hydration. You can make masks from natural products and use professional products for care and hair restoration. Special attention should be paid to ends as they dry the most. Once a month, cut your bleached ends so they look healthy, beautiful and well-groomed. For many decades the bright hair was a symbol of femininity and attractiveness. To this day thousands of brunettes spend a lot of effort in order to lighten hair and transform into delicate blondes. However, improper dyeing or the wrong choice of paint can nullify all the efforts, making hair dull, lifeless and brittle. How to achieve the desired goal and not to lose existing wealth? Having made the decision to become a blonde, first and foremost, it is necessary to objectively assess the condition of your hair. Were they already painted? Is there a Perm? What are hair by nature: thin or thick, hard or soft. How they are healthy and if there is irritation on the scalp. This is important, because the main means of lightening – the hydrogen peroxide may be too aggressive for fine or weakened hair. To pick up lightening the paint with the help of a professional hair colorist who can advise on the most suitable shade. If this is not possible, you should discuss the matter with his master, who constantly cut. It is important to remember that it is not recommended to lighten hair more than 2-3 colors in comparison with natural color. Otherwise, you might cause hair serious harm excessive discoloration. Moreover so radically bleached hair can be unprofitable to contrast with the colour of the skin, eyes and eyebrows. If the hair is thin or weakened paint to lighten it is necessary to choose very carefully. It is better to stay on the products of reputable, well-established firms, because the big brands attach great importance to quality control of their products. Particular attention should be paid to the composition of the paint. High-quality products in addition to decolorizing the pigment composition includes natural oils, softening the action of aggressive substances. In addition to the package in addition to the ink and fixing composition should be attached to the bag with a soothing balm. If you still have any doubts regarding the possible results of the staining, it is better to abandon permanent hair color in favor of clarifying shampoos and foams. Their impact is much softer and less breaks the hair structure. To lighten hair in the hairdressing salon, or on your own home. In the second case, you need to prepare everything necessary before starting the procedure below in the dyeing process is not interrupted in search of the right things. For home bleaching will need paint, the instructions to her, glassware for dilutions, brush to carry the paint on the hair, a comb, an old towel and gloves for the hands. To start the procedure of staining, always with careful consideration of the user. Even if you have already used this paint before, read the attached guidance still useful – it could remind you about some accidentally forgotten the details. In accordance with the guidance necessary to prepare the dye solution and apply it on the hair, successively dividing them into separate strands. Don't forget that paint is applied to dry, unwashed hair. First, the composition is superimposed on the main part of the hair and in 15 minutes then to the root zone. Then the paint is evenly distributed over the entire length from root to tip. The duration of the coating depends on the desired degree of lightening, but no more than 30 minutes. Then hair carefully to rinse, then wash with shampoo and rinse with a firming balm. Drying with a hair dryer bleached hair is undesirable, because hot air is dry and without fat-free paint strands. Dyeing hair at home will not be easy, if you stick to the instructions spelled out in the annotations to the paint and our simple but useful tips. At home it is recommended that you coloring the hair to match or with a difference of 1-2 pitch. If you radically want to change color, from brunette to become a blonde, this procedure is best done at the salon. hair dye, gloves, a towel, a mixing container (not metal), brushes for applying paint, clips for hair, conditioner. The first step when painting strands of hair consists in choosing paint.Home carefully read the instructions for the application of paint. When using for the first time, it is desirable to test for allergic reaction. To do this, apply a small amount of paint on your wrist and wait awhile. If the skin is not red, you can start the main procedure. You must first lubricate the forehead and temples any fat cream that accidentally got a drop of paint does not stain the skin. Just do not hook the cream hairs, otherwise the paint will fall unevenly. To put on gloves, they usually are supplied to the paint. Stir in special small containers, strictly adhering to the description. Hair before dyeing don't wash. Separated dry the strand (usually start with the crown) and brush applied paint. If painting hair the tone produced for the first time, that strands begin to paint from the roots going to the tips. If you have already used this tone, and you need to touch up the roots, then, of course, paint is applied to the same roots. And then after a certain time, brushing her hair to the tips of the hair. If you have long hairs, then every strand is coated with paint, it is better to stab a special clip or regular clip. Different paints have different exposure time on the hairs. This is all stated in the instructions. Depending on the structure of the hair and the desired effect, the paint is kept on the head for 20 to 40 minutes.After some time colouring it is necessary to slightly dampen the hairyou massage them with your hands for the best effect of consolidation of the ink. Wash off the paint under warm running until complete discoloration stekaemoj water. Sometimes you want to change your hair color, but not radically, but only to make darker or lighter. This is true in the case of bad staining. For clarification, there are several natural and professional hairdressing tools. Try out lightening hair with honey. It is an old folk remedy. And even to lighten hair it helps not always, but the advantage of it wholly. It is believed that honey stands out the substance that acts on the hair like hydrogen peroxide and therefore lightening them. However, hope for a clear lightening black hair is not worth it, especially if they are dark by nature. Most noticeable effect will be on colored hair - dark pigment of them washed out soon. But the use of this mask will have more than once. In any case, the hair will grow better and become healthier. Wash your hair, towel dry, massage the honey. Calculate the amount in advance, based on the length and thickness of hair. 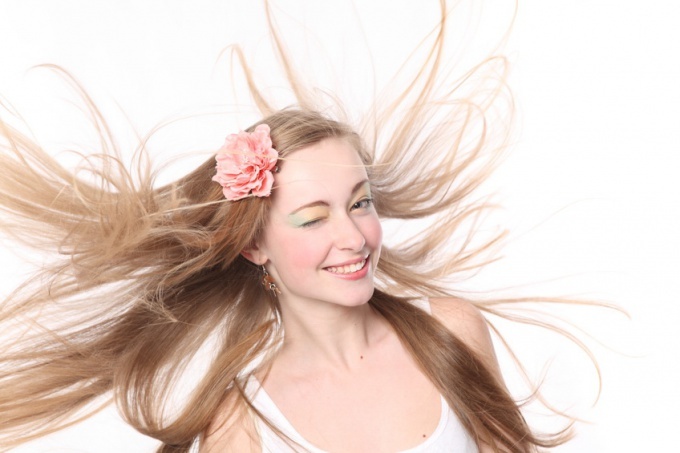 To lighten hair it is recommended to use the acacia honey. It is necessary to hold the mask for at least several hours - the more the better. Do not wear cellophane cap, better wrap the head with towel or kerchief. If you have enough patience, you can go to sleep with this mask. As a folk lightening means to apply the yogurt and mayonnaise, light beer. Again, the effect is more pronounced if the mask applied to dyed hair. This includes the classic folk remedy for hair care - oil. All this is rather extra ways after a failed transformation into a brunette. They will help to soften the too bright shade of paint. For best results, these masks should be done several days in a row. Some women use chamomile. But Daisy probably dyes his hair in Golden color than it really brightens them. Enhance the effect by adding 50 g of glycerol in a solution of chamomile and hold the mask on your head for half an hour. More radical means - lighten dark hair lemon. After washing your hair rinse them with lemon juice. Hair will Shine and a few times will be a little lighter. However, do not overdo it with concentration of juice - lemon can make your hair dry and brittle. The real way to significantly lighten dark hair is to use a wash. This tool washes away the pigments of the hair and restores their natural color. Buy a wash at the store of hairdressing supplies. Remember that this is a chemical agent that damages the hair and dries them. After this procedure regularly take care of them and make a mask. It would be better if a wash will make you an experienced hairdresser. Modern tools for hair coloring at home allow you to create a variety of hairstyles. Including to do weave. It is important to find the color and width of the strands. Highlighting "Zebra", when on dark hair are a platinum feathers, are long gone. Now stylists advocate the naturalness and do the tinting or coloring of the strands. This method allows you to visually make your hair more lush, iridescent, shiny. To achieve maximum effect, when painting, use several shades - from dark to light. At home to repeat this procedure quite difficult, but the tinted strands in one or two colors you can own. Home experiments with hair colouring it is better to start with staining the strands in one color. The most important thing in a beautiful highlights - the right choice of shades. Brunettes will make an impressive dark-brown or blue-black strands. Brown hair copper color swallowtail, reddish. Rus will suit cool tones with the addition of a purple colour. Blonde "revive" platinum or bright yellow strands. Red hair bright enough without highlighting. But if you want to make the color more saturated, can make a painting with a red or bronze color. Paint for highlighting is better to choose one or two tones darker or lighter natural hair color. Without specific hairdressing education, you can easily cope with the weave in one or two colors. Combined with natural shade of hair get enough textured hair. Highlights can be done in two ways. The first is the simplest - using a special cap. It needs to be put on dry hair and gently use the hook to pull strands through the holes. It is very convenient, as the number and thickness of strands can be adjusted independently. Next is staining. First apply a lighter color then the dark. Can be covered with dye the strands in one row or alternate colors in a checkerboard pattern. The main thing is to ensure that the strands do not touch, otherwise the colors will mix. Therefore, already painted curls to gently put the cap on one side of the rows of holes - one color, on the other hand is the second. Paint shampoo, specified in the instructions. Then it has to be washed off with warm water, remove the cap and apply the balm. The second method is home bleaching using foil. It's gonna need a mate, because to separate the strands in the occipital and parietal areas yourself very uncomfortable. Starts staining the top of the head. With the help of the hook are separated by a thin strands of hair to make the curl width three to five inches. It is enclosed by a foil and is applied to the coloring composition. This procedure is repeated over the entire head. Shades of highlighting you can alternate or do more dark or light strands. It all depends on the wishes. After some time the strips of foil are removed, the paint washed off and applied the balm. The fine weave is a complex and lengthy procedure during which a small hair dyed strands of hair, allowing you to emphasize the structure and to increase the volume. It can be done independently, but it is better to trust the master. If you often dye your hair yourself using the latest paint, you will likely be able to achieve a decent effect with minor highlighting, but it is a very time consuming process, so it is better to implement it in a good salon. Fine weave suitable for women with any shade of hair from very light to brown. With this highlighting can completely transform even an ordinary haircut. This is particularly effective type of highlighting looks great on short hair. For this procedure, use the special cap with holes for short and medium hair and knives in foil for long. The classical method is considered to be the highlights using the cap, sometimes called "feathers". In hole pull thin strands, using special inks are clarified, then (do not remove cap) hair is washed, avoiding getting paint on the main part of hair. This method is best suited to owners of short and thin hair. Highlighting for thin long hair use a plate foil. First, the strands stand out with the tail comb, they are placed on special plates foil, separating from the main mass of hair, dyed, and then the foil is wrapped neatly, this allows you to save from the effects of paint of the neighboring strands. This method of dyeing is considered safe and is best suited for long hair. After the procedure, highlighting many masters recommend toning hair, it softens the sharp transitions between the main a natural hair color and the bleached strands. Best hair tinted a few days after dyeing, so they have time to relax. The weave is fairly gentle, especially compared to a full painting. However, it is necessary to observe some precautions so as not to harm their hair. It is not necessary to do highlights too often or abruptly change the tone in contrast. You must use specialized shampoos and conditioners for colored and highlighted hair. And between a weave and a Perm must go through at least a month to get the hair did not suffer from negative influences. Well made fine weave gives the effect of sun-bleached hair that looks very attractive. In addition, it allows you to experiment a little with his looks those who are afraid of radical changes.